Craig Counsell, the newly announced manager of the Milwaukee Brewers, accumulated more than 1,000 hits and won two World Series in his 16-year Major League Baseball career. But many fans best remember Counsell for his trademark batting stance. The former Marlins, Diamondbacks and Brewers infielder would settle into the batter's box, stand up on his front foot, extend his arms as high about his head as they would reach and practically lick his armpit as he waited for the pitch. In honor of Counsell's hiring, here are some of the other most absurd stances in recent memory. Like Counsell, Batista enjoyed a nice MLB career. 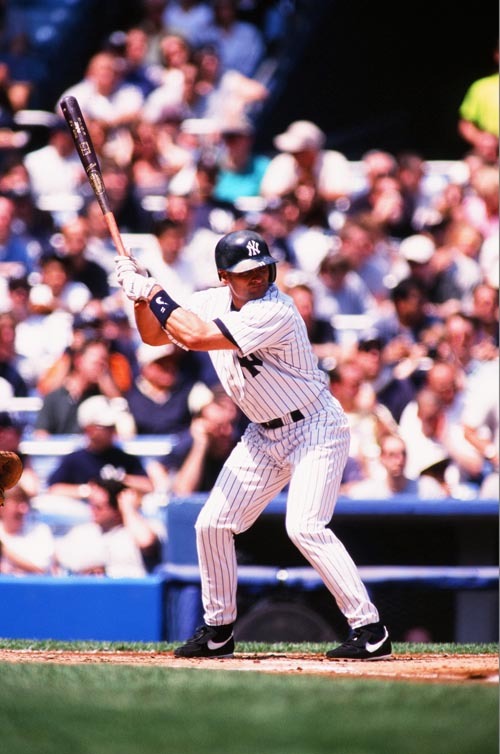 And like Counsell, Batista's odd, open batting stance might be the most memorable aspect of his game. Many hitters open their front leg toward third base (or first for a lefty), but Batista altogether dismissed the concept of front and back legs. The former outfielder stood practically facing the pitcher, with his legs perpendicular to the path of the pitch. How he ever hit an outside pitch remains a mystery. If a kid showed up to Little League practice with Kevin Youkilis’ batting stance, his coach would either laugh or cry. Youkilis took “elbow up” to new lengths, angling his arm skyward as if trying to elbow an angel. He also pointed the bat almost directly at the pitcher and kept his feet awkwardly close together and bent his knees so that he looked almost bow-legged. But by far the oddest aspect of Youk’s stance was his top hand's placement on the bat. Instead of holding his hands together like basically every player of the last 100 years, Youkilis moved his right hand several inches up the bat, sliding it down when it came time to swing. Jeff Bagwell was one of the best players of the 1990s and 2000s and will likely reach the Hall of Fame in the coming years, so we can’t question much about his approach. Still, it’s difficult to figure exactly how the first baseman racked up such gaudy stats with such an unnatural-looking stance. Bagwell spread his legs farther than any hitter has before or after and crouched far enough to inflict vicarious pain on the less flexible among us. 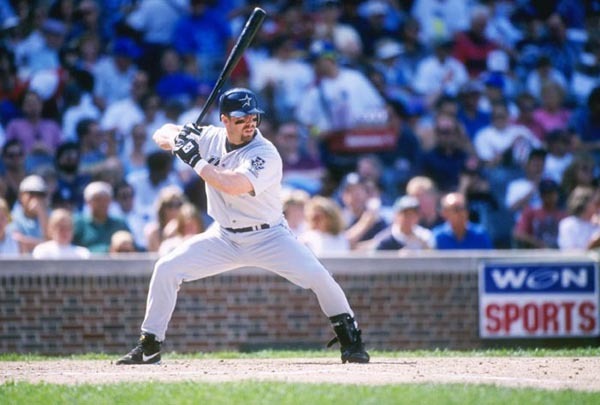 The stance did create the illusion of a smaller strike zone, so maybe Bagwell’s crouch earned him a few extra walks. Aaron Rowand's batting stance changed over the course of his career, but at no point could it have been called conventional. The former Phillies, White Sox and Giants outfielder bent his knees like Bagwell, only without spreading his feet or leaning forward. So instead of looking like someone stretching his hamstring, Rowand often seemed to be sitting on an imaginary stool, with his knees pointed uncomfortably outward. As if Rowand’s odd leg and torso arrangement wasn’t odd enough, he also spent much of his career holding his hands oddly low and pointing the bat directly upwards. When his hands weren't low, they were atypically far behind him. 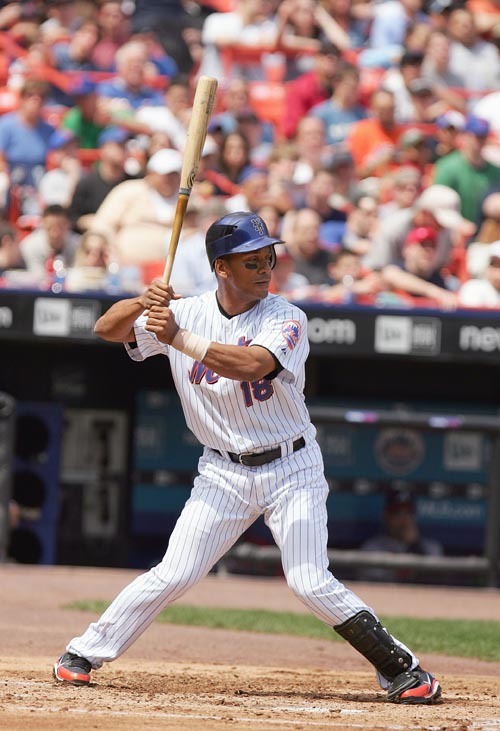 Above the belt, Moises Alou's batting stance seemed normal. Below the waist, however, the six-time All-Star turned his knees inward so that they pointed toward each other while his feet remained a reasonable distance apart. Given that stance, he would seemingly have trouble standing, let alone swinging. Chuck Knoblauch was an amalgam of oddity in the batter’s box. At various points in his career he crouched, leaned forward and, most memorably, extended his the bat backwards toward the stands behind him. His stance was mildly disturbing in a variety of ways: body a little too low to the ground, head a little too forward, hands a little too far back and of course that bat pointed in the wrong direction.